I like my soup to be chunky, dont like it completely smooth. 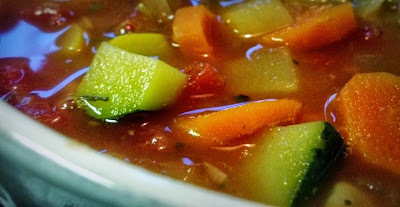 And one soup I love is the clear vegetable soup. I remember having a version of this in Cascade years ago. Last month one day I stood staring into the veg tray for a few minutes, shut the fridge and repeated the same once again. I gave up! I had 2 carrots, a small piece of cabbage, 1 onion, 1 potato, handful of fresh peas, 1 tiny bit of zucchini, 1 tomato and a small piece of tofu. I broke my head for a while and finally a lightbulb moment happened. I decided to make the soup for dinner and have it with 2 slices of multi grain bread. 1. Chop all the veggies into cubes and set aside. 4. Once the vegetables are all cooked, take a tbsp of the same and puree. Your soup is now ready to be served!! As you can see, sky is the limit when it comes to soups! !